Kissing in America was a completely different read than I anticipated. I expected a cute, fluffy contemporary romance and instead I got a much deeper story of love, friendship, and family. I ended up really appreciating this book for those reasons, even though it was a bit longer than I'd liked. Some parts seemed to drag, but I really enjoyed watching Eva and Annie road trip across the United States. Eva is a teenage girl who is obsessed with romance novels. She dreams of a great love like in her stories and I have to say I cracked up quite a few times at some of her books' excerpts. Rabb purposefully cheesed them up and I really liked those burst humor moments. She has a huge crush on a boy at school named Will, who she helps in the tutoring center every week with his college papers. They develop a friendship and soon she finds she can open up to him like no other. She's a bit lovesick over Will and after sharing a few kisses with him, is convinced they are meant to be... until Will drops the bomb he's moving to California. Eva is determined to go and visit him and she convinces Annie to audition for a 'smartest girl in America' show, thus giving her a chance to meet up with Will in California. While her reasons aren't entirely selfless, it's a great opportunity for her friend to earn some scholarship money. Their trip is riddled with quirky and humorous encounters, what with a crazy aunt, a jealous cousin, and plenty of soul searching moments for Eva. Eva learns a lot along the way not only about herself, but also about love. She makes some monumental mistakes, but she learns from them and I liked seeing that. Eva's relationship with her mom was by far the one that made the most impact on me. After Eva's father died, things have been difficult for them and their relationship has been strained. Her mother has dealt with her grief by throwing herself into her work and trying to erase his memory. Eva, on the other hand, is still trying to come to terms with it, even years later. She comes to resent her mother for this, so watching them try to repair what has been broken was really poignant to watch. Overall, I don't think this book will be for everyone as it is more character driven than plot driven, but getting to the end was well worth it for me and even had me tearing up a bit! 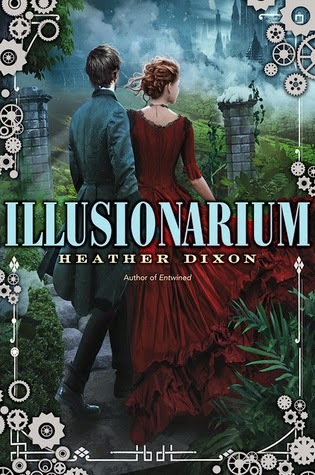 Having really enjoyed Dixon's debut Entwined, I was excited to see what Illusionarium would hold. Unfortunately, this book was not for me. I never truly felt like I could get a grasp on what was happening and it was always a struggle for me to keep up. It's very fast paced, which is a plus, but it was too fast for me to comprehend everything Dixon was trying to get across. To put it plain and simply: this book was confusing. There are so many layers and explanations of what's going on with the illusioning and alternate realities that it just made it too hard to keep up. I also felt the characters were rather flat. I realize this is set in the 1800's, but Jonathan was so awkward to me. His speech, mannerisms, it all felt too strange. I didn't particularly care for one him one way or another. He ended up surprising me by the lengths he would go to in order to procure the cure for his dying family and friends. We see him go from bumbling, awkward scientist to fearless illusionist, who will stop at nothing to return home and save the people he loves. I thought that was awesome, but I missed seeing that transformation. We don't really find out the mechanics of this alternate reality, called No'dol, until late in the book and once we do things made a bit more sense. I felt there were some plot holes also- things were introduced but then I never saw them really referenced or resolved. I eventually found myself skimming more than reading, just to get to the end. It was just too hard for me to wrap my head around this one and I felt it was really lacking in some major areas such as development and characterization. There was TOO MUCH going on that I felt not enough time was taken to really explore and focus on the things that mattered. I am still reeling over that ending! I honestly didn't see that twist coming and I feel like my heart has been gutted because I didn't want it to be true. I was intrigued by the idea of a human zoo and alien captors, so I thought this would be a pretty neat read to pick up. 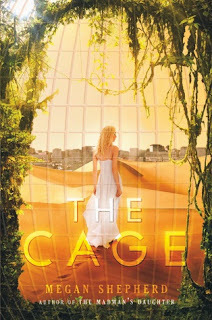 While I ended up enjoying The Cage, I had some trouble really getting into this one. I'm glad I muddled on through though, because things definitely picked up and I was interested in this world Shepherd had created. This book is told from multiple point of views, which can tend to be overwhelming, but I didn't feel that way here. It is mainly told from Cora's, so that helped from feeling too disjointed. These teens are thrown together in an unknown world and have three rules to live by: solve the puzzles their captors have designed, take care of themselves in terms of getting proper rest and nourishment, and procreating with their 'match' to ensure the continuation of the human race. Yes. You heard that last one right. Whew. Talk about a doozy. Obviously, this doesn't sit well at first for these kids and they are determined to fight back and find a way out of this prison. However, some of these teens did not have the best lives back on Earth and find themselves resisting less and less. There are only a few characters I actually liked in this book. I liked Cora and her will to survive and flee, as well as Lucky, a boy she unknowingly shares some history with- but the others- Leon, Nok, and Rolf were not in my fan favorite category. I also wasn't crazy at the love triangle prospect. It's clear Lucky has feelings for Cora, and she returns them for a time, before she finds out about her and Lucky's connection back on Earth. However, in order to survive they still must follow the rules... even #3. Then comes Cassian, who is their Caretaker. It is his job to ensure they are obeying the rules and making sure they are not harmed in any way. He takes a liking to Cora and I ended up really liking him. He is not this heartless being who doesn't care, but instead he is more expressive than the others of his kind. He is torn between his affection for Cora and his duty as Caretaker, so I liked seeing that push and pull dynamic. There are some pretty big developments on his part though, so I'm not sure how this 'triangle' will be affected in future books. There are obviously a lot of unanswered questions at the end of this one, so I am definitely curious enough to pick up the second book to see where Shepherd will take these characters (and what they have discovered) next. While I had a few issues with this one, I did end up enjoying it as a whole and thought the idea behind their imprisonment was quite intriguing. 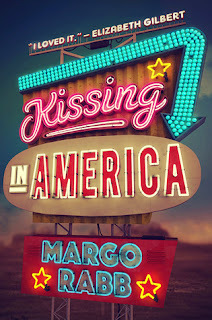 I'm really excited for Kissing in America! It's one of my most anticipated reads of the year and something I think I'll enjoy. Great reviews! I'll be checking out the Cage. 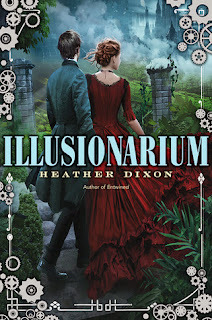 I'm am so bummed to hear that about Illusionarium. That one sounded so good! You have me super curious about The Cage now. Gotta make time for that one. Great reviews! 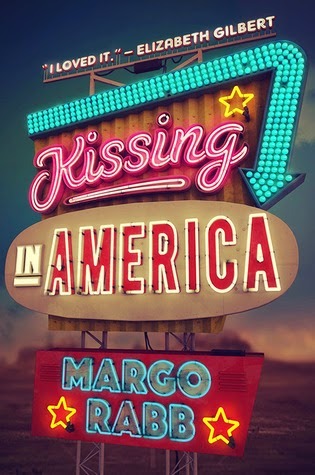 I picked up Kissing in America at BEA and I hope I like it. I do love character driven novels, so I think that's good. Mini reviews! I felt about the same about The Cage, but I liked Illusionarium a lot :) Glad to see that you enjoyed Entwined though. I have not heard much about Kissing in America! I probably won't be picking it up :/ Great mini reviews, Jill!